One is a city of older homes, spacious and elegant away from the 101, morphing into urban sensibilities and upcoming renewal to relatively dense population moving eastward. San Mateo neighborhoods show the contrast of organic growth --- how personalities, zoning, and economics combine to create the feel of an area that changes (or doesn't) over time. The other is Atlantis reclaimed from the Bay, bringing with it an enviable landscape: curving streets and arched bridgeways glide through the greenery, which itself is beautifully manicured to meticulous perfection. The Foster City atmosphere creates an impressive Epcot Center-like portrait, with Roman order and discipline --- ask anyone who's slow rolled through a stop sign on the suburban side of Edgewater Blvd. The two cities share a common bonds that stretch well beyond just the numbers 94404 and the 101 artery. The first is, while neither is in the traditional boundaries of Silicon Valley, you'd have a hard time convincing the people who live there that they're not Silicon Valley residents. They also share Hillsdale High School, a newly designated California Distinguished School in 2007. It's no wonder that Foster City has in recent years decided to focus more on economic development than building a high school of its own. But when you look at the graph of Foster City median home prices, there's something wrong with the picture. It's subtle, but my clients depend on me to see these things. The question is whether it's an opportunity or an obstacle for them. So How Much More Is a Home Worth Than a Condo? 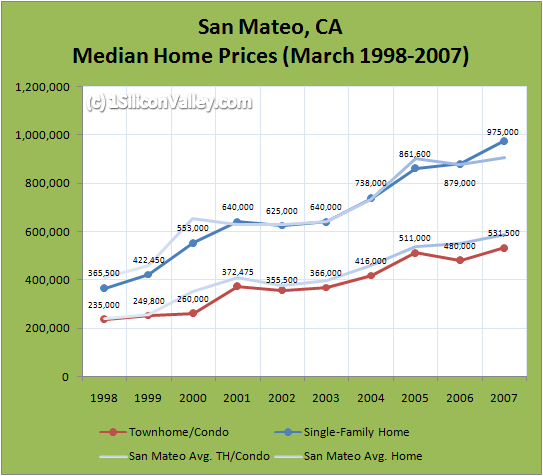 In my April 2007 Cupertino Home Prices Update and Sunnyvale Home Prices Update, I talked about one way I look for good values for my clients: based on how expensive median homes are in a city relative to the county average. 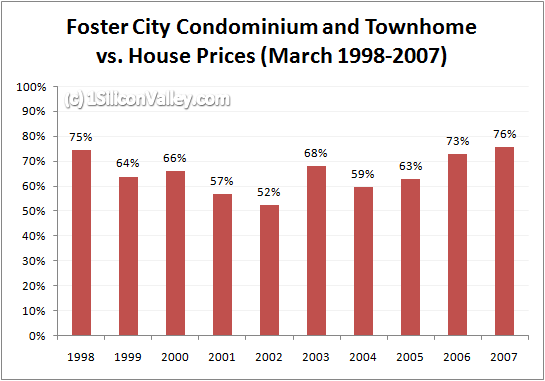 In March 2007, the median price of a Foster City townhome or condo was three-quarters --- literally, 75.8% --- of the median price of a single-family house. The average in San Mateo County over the last ten years is 60.8%. So if condominiums and townhomes in Foster City are three-quarters the price of a house, does that make Foster City houses cheap or Foster City condos expensive? The answer depends on how much you like the water. What's unique about Foster City is the man-made lagoon system that stretches throughout the city like a canal-way. There are many more apartments, townhomes, and condominiums along the water than there are freestanding single-family homes and --- despite the fact we're surrounded by water --- desirable waterfront property is exceedingly rare in Silicon Valley. The historical average over the last ten years says that condos and townhomes in Foster City usually cost 65% of what the median single-family home costs. The ratio is high right now so, I recommend to my clients that they wait or search elsewhere unless we find a special property that they fall in love with, namely one on the lagoon. After all, current inventory was exceedingly low this year with only 17 on the market compared to 36 last year. Why would I encourage my clients to fight (i.e. pay) for something that may not be special to them? Given a meager 7% price premium for single-family homes in Foster City over the San Mateo County median, Foster City houses are a good deal by the numbers. The primary school system there is decent, but not prestigious, reducing any price premium for education. If that sounds like a half-hearted recommendation, that's because it is: my clients either love or hate the atmosphere in Foster City and it's a strong emotional reaction either way. What's Happening in San Mateo? Single-family homes in the City of San Mateo spiked above the San Mateo County average for the first time since 2001. No major spikes or dips in new listings or inventory. Condominiums and townhomes did see an increase in average days-on-market (DOM) from 49 to 69 to go along with the 10.7% price increase. That looks like a large jump, but that's after the opportunity last year when common interest development prices took an unfairly large hit relative to the San Mateo County median. There's something interesting going on with the bathrooms, though. Don't worry, it's safe to look! This map shows all the currently available one bathroom single-family homes in the City of San Mateo. Why do I alert my clients to these areas? Economic obsolescence. I don't usually recommend one-bathroom single-family homes to my clients because they're generally harder for them to re-sell unless you renovate them, or they're in a prestigious area. And it doesn't take a stretch of the imagination to see why, particularly if my clients (or their potential buyers) have guests over. If my clients are set on having a yard, we'll talk about their needs and what they're really looking to get out of it. Often, their needs can be fulfilled by a number of townhomes (some with surprisingly spacious yards) that offer a better value than one-bathroom single-family homes. Of course, the benefits are sometimes offset by HOA fees (some HOAs are better than others) in which case the free-standing house becomes a better value. From a macro-perspective, the density of one-bathroom single-family homes for sale is a pretty good indicator of neighborhoods that are in trouble. You might find homes like these in prestigious places like downtown Mountain View (where the home will almost certainly be expanded) and Palo Alto (where zoning laws may prevent expansion), but never for sale in bulk. And a few are usually scattered just about everywhere, often being sold by lifelong residents. But when you have a cluster of them, there is no way that a high percentage of them will be modernized without major --- usually corporate or government --- money pouring into the area. And when you cluster a set of economically obsolete homes together, you get the real estate equivalent of a dollar-store, a place where you can find inexpensive wares that aren't necessarily bargains or investment material.